Next Saturday (August 6th) is National Friendship Day. It's also the last weekend before kids return to school here on the Space Coast. Translation? Since I'm a school teacher and have to return to school the week before, Saturday is most likely going to be a work-in-my-classroom day, because heaven knows, there's not enough time during the "work" week. (Ok...don't get me started.) I'm wondering how a "Friendship" party may go over on Saturday...in my classroom, of course. Why do I have a feeling everyone will already have "other obligations"? ;) How about you? How will YOU will celebrate National Friendship Day? In honor of National Friendship Day, the challenge this week at Heart 2 Heart Challenges is "Friendship". Create whatever you want to show us what that means to you. There are some "rules" though, so please keep them in mind when joining the challenge. Rule #1. Use Close To My Heart products in your submitted project. It doesn't have to be 100% CTMH, but I know the more CTMH product I see, the bigger my smile. Rule #2. You must mention H2H in your blog post or photo gallery description. A link back to the H2H blog, would also be appreciated. When you're ready to play along, simply upload your project photo to your blog, or other photo gallery site, copy the direct link and go to the H2H blog and click on the link at the bottom of the challenge post. Then just follow prompts. It's that easy. (Instructions are in the right side bar of the H2H site, too.) If you need some CTMH products to work with...or you just want some more (who doesn't want more supplies?! ), you can contact your current CTMH consultant, find a local one here on the consultant locator under the "What We Do" tab, or feel free to shop my website. I'd love to be your consultant if you don't already have one. Are you thinking to yourself, "Tamytha! Are you sure those are Close To My Heart products? I've never seen those stamps or thin cuts...or that glitter paper...vellum...embossing folder, or ink colors. Oh, and the pearls. You must be confused!" LOL....I'm not confused. I'm excited! They ARE from Close To My Heart!!! It's ALL new and it's ALL available to you on Tuesday, August 1st!! August 1st is the debut of the brand new 2017-2018 Annual Inspirations Idea Book! Contact your CTMH consultant for your own copy, or check out the online version here, or get one free from me with any $25+ order (or have made one within the past year)...just contact me for details. There's so much crafty yumminess to be had! Cut a 3 7/8" x 5 1/8" panel of vellum. 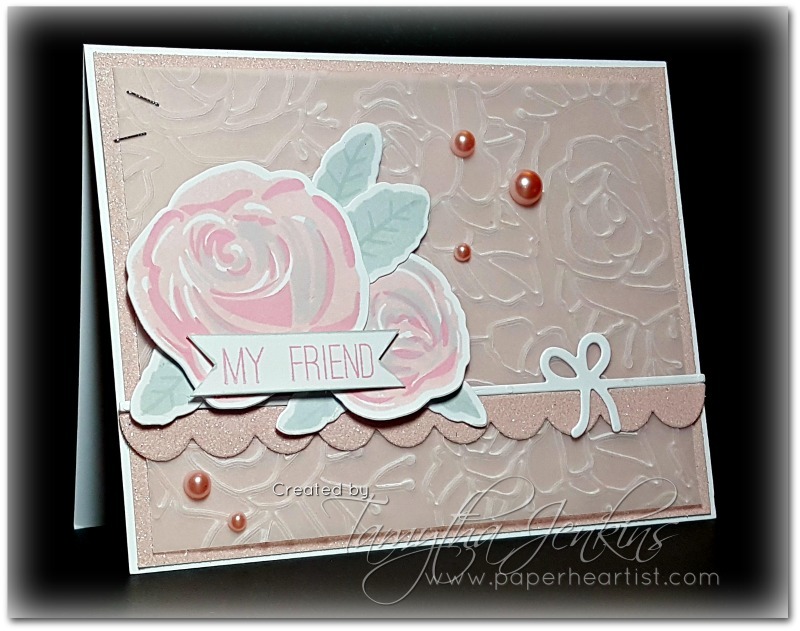 Using the Rose Embossing folder, emboss the vellum. Use the Scallop Thin Cut to cut the Bashful Glitter border and the Ribbon Border Thin Cut to cut the White Daisy ribbon/bow border. Adhere approximately 1 to 1 1/4" from the bottom (and centered horizontally) of the vellum panel, with the ribbon border die cut flush with the top of the scallop border piece. The roses are created with our new Beautiful You three-step stamp set (on White Daisy cardstock). I used our new Color-of-the-Year, Bashful, for the largest part of the rose, Pixie for the middle-sized rose, and one of our new Basics colors, Pebble, for the smallest part. Next, I cut the flowers out using the coordinating Thin Cuts for the Beautiful You stamp set. I created the leaves by stamping the leaves in Pebble ink on White Daisy cardstock and letting dry completely before stamping the veins in Pebble ink. (If you do them one right after another, the veins don't show up as well...since I used the same color ink to do both the leaves and veins.) Again, I used the coordinating Thin Cut dies to cut out the leaves. On a small scrap of White Daisy cardstock (approximately 1/2" x 2"), I stamped the sentiment "My Friend" in Pixie ink, inked the edges in Pebble ink and used my microtip scissors to cut the dovetail ends. I then layered the roses, leaves and sentiment using thin foam tape onto the top of the vellum layer and added the Bashful Pearls, as shown. Next, I adhered the embellished vellum panel to the glitter panel by strategically placing adhesive behind the embellishment/design. (The Micro-sized glue dots are so tiny that they can be used behind the vellum without being obvious, especially if it's behind the embossed lines.) I also used the mini-stapler to staple the vellum to the glitter panel. It adds a cute touch and helps secure the vellum to the card. Finally, I glued the embellished glitter panel to a White Daisy card base. Voila! Now you have a beautiful and elegant card to send to a friend. Now it's your turn. We'd love to have you join us at Heart 2 Heart Challenges. Remember. Every Monday morning a new challenge is posted with the deadline to enter at midnight on the last day of the month or on the Saturday following the month's final challenge. The challenge varies from week to week and can be a color challenge, a sketch, an inspiration photo, a theme challenge, or something else. You can choose to play along every week, or just play along when the challenge moves you. As I mentioned before, the only requirement to play along is that CTMH products must be included in your submitted project, but it doesn't have to be 100% CTMH (and it doesn't have to be new product either). I hope to see you over at H2H! I'm pleased to announce that I'm back with Heart 2 Heart Challenges as a Design Team Member. I probably have no business taking on any other responsibilities, but there's something about commitments and deadlines that drives me...motivates me...forces me to take the time to create. Otherwise, all of those other responsibilities take over and I push crafting to the back-burner and then the blues start to creep in. Creativity is truly therapy for me. What about you? What do you do to keep "sane"? Whether you create as a form of therapy or you create simply for the pleasure of it, I hope you will join us over at Heart 2 Heart Challenges blog for this week's challenge. We are divided into two teams (A & B) and each team will post art work every other week. (The names of all 12 design team members, and their blog links, can be found in the side bar.) This week is team B's turn (the team I'm on) and our challenge is called "In Stitches". One of the great things about the H2H challenges is that they are almost always open to interpretation. What do you think of when you read "In Stitches"? Is it a needle and thread? What about a layout of a child who required stitches or everyone laughing? Or maybe it's something completely different. The stamp set "Happy to Be Friends" and the paper pack "Rustic Home" is retiring this month also. I love happy accidents. Because alcohol markers bleed through, I noticed that the "back" side of the flower was a lighter version of the colored side. So I chose to use the lighter side for two of the blue flowers. As you can see above, the middle blue flower is darker than the two blue flowers on the sides. The darker blue is the side that I colored with the alcohol marker. The lighter blue flowers are the back side of the darker blue. Fun fact: CTMH has already released the new double-sided cardstock, which was revealed at Convention. It was supposed to go live to customers on August 1st, but it's already available online. That cardstock would allow you to skip the alcohol markers and still get this kind of color variation. Cut a 4" x 5 1/4" White Daisy cardstock panel. Cut pattern paper to 2 1/2" x 5 1/4". Ink the edges, if desired. Adhere the pattern paper to the top part of the White Daisy panel and round the corners. Cut nine White Daisy flowers from the Flower Market cartridge. Before removing them from the cutting mat, color the flowers using Shin Han Markers or other medium. Of course, you can always just cut colored cardstock or even pattern papers...OR the new double-sided (two-toned) cardstock! Using a stylus and foam mat, shape the flowers slightly. Place the flowers on the panel until you have an arrangement you like, but do not adhere down at this point. Use a pencil to lightly draw lines where the "stems" are to go. Using a stitching ruler, pierce holes along the pencil lines. When finished, erase the lines with a clean, white eraser. Adhere the flowers to the panel, so they line up with the stitched lines, of course. Add bling to centers. Fold an 8 1/2" x 5 1/2" card base in half using a bone folder and round the corners. Adhere the decorated panel to the front of the card base, using foam tape. If you'd like to make this card, you can follow the directions above or you can use the Cricut Design Space file I created. Here is the link or click on the photo below. It's absolutely free, but you will have to have the Flower Market cartridge to create the same flowers and sentiment font (I stamped my sentiment, though), but everything else is basic shapes. You will have to use a corner rounder to get the rounded corners that are shown on my card. If you need some CTMH products to work with, you can contact your local CTMH consultant, or feel free to shop my website.